Hillary Clinton’s edge over the Republican presidential field is gone. 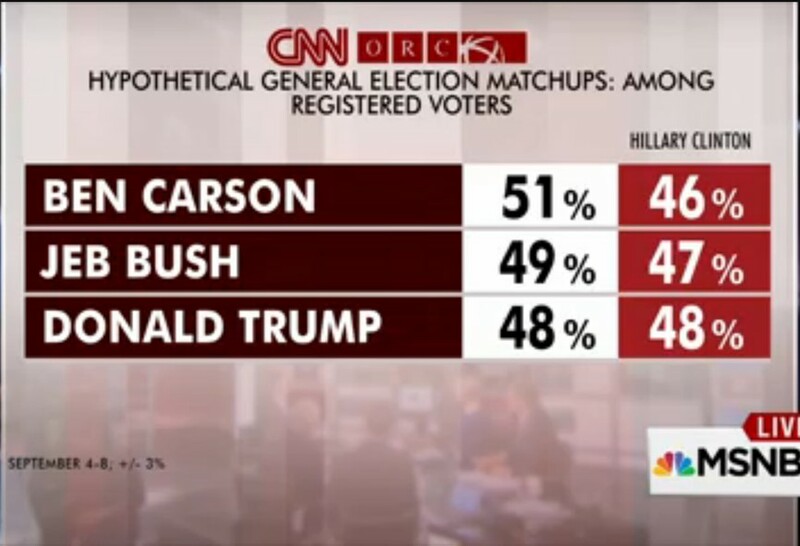 After weeks of moving steadily in opposite directions in public opinion polls, a CNN/ORC survey unveiled Thursday finds GOP frontrunner Donald Trump, Ben Carson and Jeb Bush now besting, or are at least on par with, the former secretary of state in general election matchups. In a head-to-head showdown, Clinton is tied with Trump at 48 percent each. Meanwhile, she trails retired neurosurgeon Ben Carson 51 to 46 percent and runs behind former Florida Governor Jeb Bush 49 percent to 47 percent. Yet, Clinton is still the preferred White House pick among Democratic candidates, despite a ten-point drop from the same poll conducted in August. She garnered 37 percent support while Sen. Bernie Sanders (I-VT) garnered 27 percent, roughly the same amount as last month. Vice President Joe Biden, who has not yet decided whether he will jump into the 2016 race, received 20 percent, a six-point increase. On Thursday night, Biden gave an emotional interview on CBS’ “The Late Show” and spoke candidly about his reluctance to announce after the recent death of his son to brain cancer. "I'd be lying if I said that I knew I was there. I'm being completely honest,” he said. "Nobody has a right in my view to seek that office unless they are willing to give it 110 percent of who they are." The poll found that Clinton has lost some support among women, the group that has made up the bedrock of her candidacy. In August, women favored Clinton 60 percent to Trump’s 37 percent. That disparity has shrunk slightly, with Clinton now garnering 55 percent and Trump at 41 percent. It’s unclear how much of the shift can be attributed to the months-long controversy surrounding Clinton’s use of a private email server while she was the nation’s top diplomat, or independent and Republican-leaning women simply going back to their party. The survey of 1,012 adults, including 395 Democrats or Democratic-leaning voters, was conducted September 4 to 8 and has an overall margin of error of plus or minus 3 percentage points. The margin of error among Democratic voters is plus or minus 5 percentage points.